In Hong Kong Grandmaster Ip Shui ran a small Dit Dar clinic in Kowloon city, treating people with fractures, sprains etc. He also treated people with a special skill called 'Wafu' that was taught to him by his Grandfather who lived at the Shaolin Monastery. This skill is unique, no medicines are required, just prayers, a brush and water. He has cured many, from those who could not walk to cancer sufferers and more. He was one of the last to do this special skill in Hong Kong. 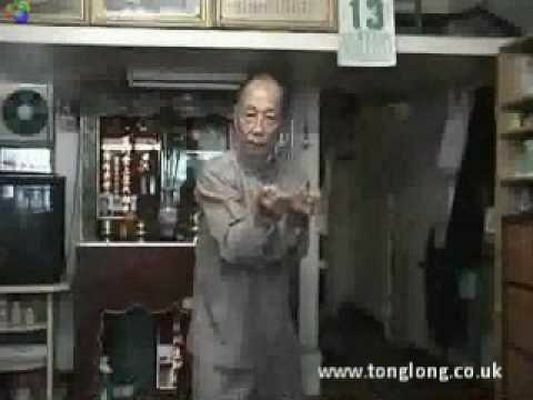 In this clip, Grandmaster Ip Shui performs the first form of Chow Gar Southern Praying Mantis, Sam Bo Jin or Saam Bo Gin (possible translation: Three Step Arrow). Unlike the power packed or fast displays of modern practitioners, Grandmaster Ip Shui's version is slower and more gentle, yet hints at power and fluidity. Another gem of a video of an art which is still mainly kept secret by the Hakka community. Glad you enjoyed the video. I will try to place up more gems of southern mantis as and when I can! Cheers. Like the blog! Thanks for dropping by. Looking forward to more videos on Chow Gar Southern Praying Mantis!